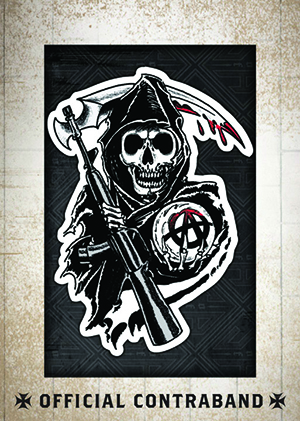 2014 Cryptozoic Sons of Anarchy Seasons 1-3 trading cards delve deep into the early seasons of the complex and often violent cable hit. Besides an autograph and either a Prop or Wardrobe card in every box, the set embraces the show's biker themes with Temporary Tattoos and patch cards. 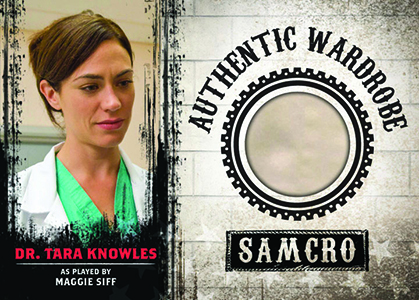 The 100-card 2014 Cryptozoic Sons of Anarchy Seasons 1-3 base set centers on the show's first 39 episodes. 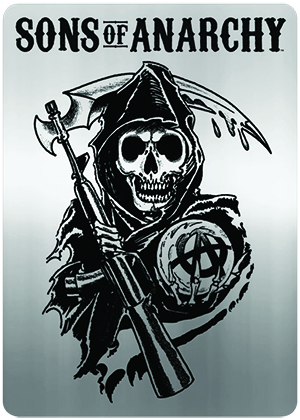 It establishes the structure and struggles facing SAMCRO, a local chapter of the Sons of Anarchy motorcycle club based in the fictional town of Charming, California. 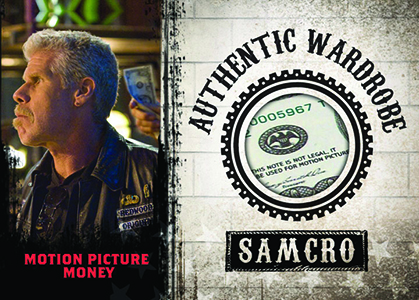 SAMCRO has a history of organized crime that involves everything guns, dirty movies and other activities that come with violent competition. Headlining each box is the promise of both an autograph and either a Wardrobe Card, which comes with a piece of costume embedded into the card, or Prop Card. The tentative autograph checklist is expansive, featuring more than 20 signers. 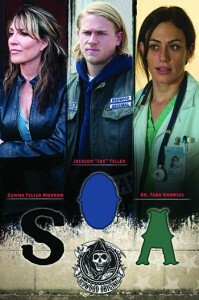 Leading the way are leads Charlie Hunnam (Jax), Katey Sagal (Gemma) and Ron Perlman (Clay). Basic inserts focus on the important sense of identity within the motorcycle club. With a little creativity, they could, hypothetically lead to some hobby cosplay. Or not. Temporary Tattoos are inserted two per box. Replica Patches are inserted 1:96 packs (about 1:4 boxes), recreating some of the iconic symbols from the show. 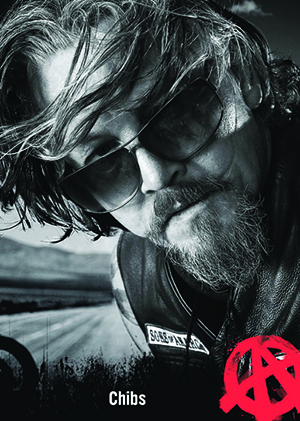 Sold separately, 2014 Cryptozoic Sons of Anarchy Seasons 1-3 has a custom binder that's made with faux black leather. It also includes an exclusive Wardrobe Card that's not in packs. Sons Of Anarchy Trading Cards Seasons 1-3 Authentic Wardrobe Opie Hat Card. Sons Of Anarchy Trading Cards Seasons 1-3 Bobby Munson Authentic Wardrobe Card. Sons Of Anarchy Trading Cards Seasons 1-3 Official Contraband Replica Patch. 25 Opie's Not the Rat! 25 cards. Inserted 1:24 packs. Click here for a full gallery. A12 Jeff Kober as Jacob Hale Jr.
11 cards. Inserted 1:12 packs. 3 cards. Inserted 1:192 packs. 3 cards. Combine with Wardrobe and Dual Wardrobe to land 1:24 packs. Combine with Dual Wardrobe and Prop Cards to land 1:24 packs. 4 cards. Combine with Wardrobe and Prop Cards to land 1:24 packs. 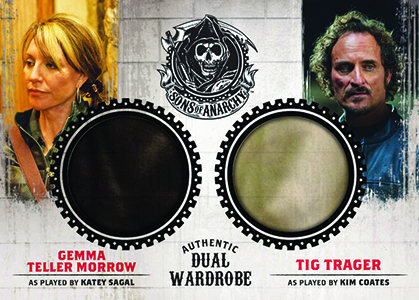 25 redemptions produced, each good for a 4" by 6" Triple Wardrobe card with costume swatches from Gemma, Jax and Tara. I can’t wait to see these! I’ve been hoping and checking back for a while! I don’t usually have any interest in non-sport releases, but with this auto checklist, and a set that actually works out quite well for having to use manufactured patches, it has all the hallmarks of something that a fan of the show can really connect with. Most of us who ride bikes would never get to experience in side of this world, but pulling a patch that says “Men of Mayhem” seems a lot more collector-savy than say a kutte with your name on it. Really think with this set and Breaking Bad that Cryptozoic is going to make waves with some mainstream fans who may not typically buy trading cards. Let’s hope so. Tyler Sullivan � I couldn’t agree more. And that’s one of the cool things about entertainment – there are plenty of fresh avenues to explore. Any idea what the relics will look like? rob � Images for the set haven’t been released yet. When are these gonna be released? andrew sanchez � No release date has been given yet. Cryptozoic doesn’t usually announce one officially until just before they’re ready to release. Can anyone give any information on prop card, P03 -Piney oxygen tank?